The most buzzworthy aspect of a mermaid's anatomy is definitely their scaly tail. Afterall, that's what separates us humans from the enchanting merfolk who call the ocean's murky waters their home. But mermaids want you to know that they rather engage in conversations that focus on other parts of their bodies, like their arms for instance. The mermaid community wants us to personally inform you that their arms are just as important as their fishy tails, which is why these green mermaid sleeves are a real thing. When putting together a one-of-a-kind mermaid costume don't make the same mistake as so many others and remember to accentuate your arms with green mermaid sleeves. Now your arms can match your legs (oops, we mean tail) by wearing these handy sleeves. Featuring printed scales on green holographic fabric, this accessory is able to fit women of all sizes. They're sleek and stretchy and cover a portion of the hands all the way up to the elbows. Also, a finger hole fastened to the end of each sleeve gives this accessory a chic appearance. 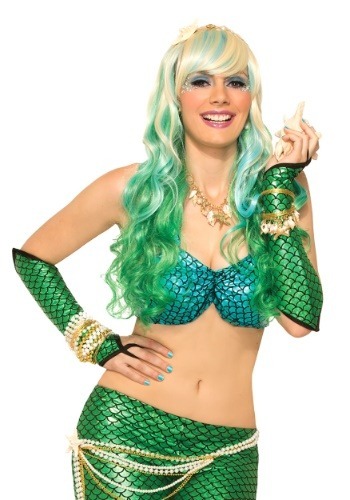 Create a tidal wave at the costume party with other accentuating accessories like a two-toned wig, starfish hairclip, and a matching tail skirt, of course! If everyone you meet wants to chat about your tail, remind them of how awesome your scaly arms are.